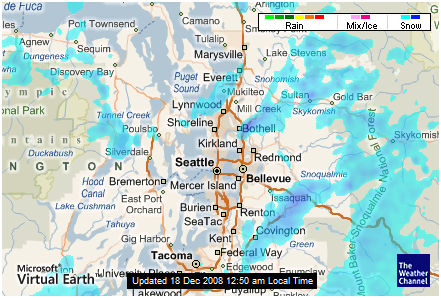 Saturday night: It snows in Seattle (rare, but it does happen). The kids go outside instead of going to bed. Sunday - The temperature drops in to the 20s. Snow doesn't melt. Drivers are confused. Tuesday - Brenda has moved the phone out of the bedroom. It doesn't matter; when it rings at 7:30 a.m., she jumps up to get it. It's a friend calling to tell us that school is, yet again, two hours late. This time, it's my turn to wait around with the kids. We go to McDonald's for breakfast. I hear about a HUGE storm coming in after midnight. Meetings are cancelled at work. 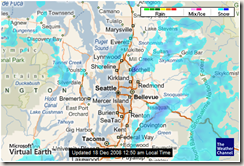 Wednesday - Even though it's not snowing, Seattle Schools are ALL CLOSED in preparation for THE STORM. Brenda and I stay home with the kids, taking turns working remotely. The storm never arrives. But we hear it's snowing everywhere else (Olympia, Tacoma, Port Townsend, etc). Fire the meteorologists who came up with this forecast for Seattle. Seattle needs to get tough about snow. It's just rain that's a little frozen. Thursday - 1:02 a.m. I just looked out the window. Still no snow.